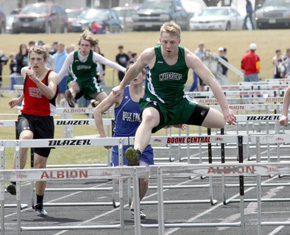 Area schools convened for the annual Mansfield Invitational track & field meet at the Boone Central athletic field in Albion Saturday, and with cooperative weather, athletes recorded a number of strong early-season performances. 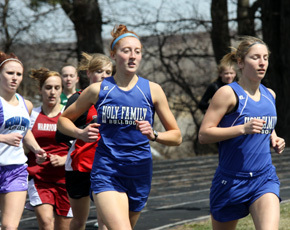 Team scoring is not kept in this meet, but all schools competing enjoyed success on a mild, breezy day. 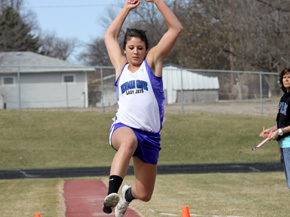 Boone Central athletes won 17 events, Lindsay Holy Family five, Cedar Valley and Fullerton four apiece, and Spalding/Spalding Academy and Newman Grove two each. Cardinal Coach Kris Pestel was pleased and impressed with her teams’ efforts. “The weather was great, so we were able to see some good performances from the kids,” Pestel commented. “We still have a long way to go in the season, but overall, our kids are off to a great start. 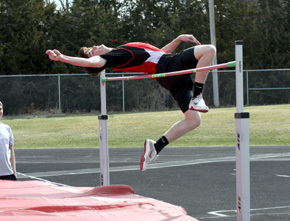 Four Cardinals won a pair of events Saturday. Senior Sara Wells led a 1-2 Boone Central sweep in the shot put (38’10) and discus (123’9), junior Jaime Kennedy won the long jump (15’9¼) and 100 meter dash (12.7), sophomore Blake Slizoski sprinted to victory in the 100 (11.3) and 200 (24.0) and junior Brett Temme claimed the shot put (42’6½) and discus (120’9). Other Boone Central athletes posting event wins were senior Bobbi Beckwith in the 200 (28.0), sophomore Parker Struebing in the triple jump (39’1½), junior Cole Luettel in the high jump (5’11), junior Tony Krohn in the 800 (2:10.6) and junior Brody Kelley in the 3200 (11:36.1). The Cardinal team of Logan Olson, Slizoski, Struebing and Jack Dbouk won the boys 4×100 relay in 47.1 and the quartet of Kelley, Jacob Lindgren, Calvin Koziol and Krohn took the 4×800 in 9:05.7. Boone Central’s Breann Thorberg, Beckwith, Kennedy and Brooke Anderson won the girls 4×100 in 52.0 and the team of Beckwith, Thorberg, Kennedy and Jade Gottier was victorious in the 4×400 (4:19.2). 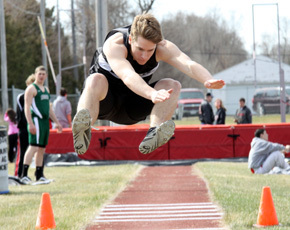 Boone Central displayed great depth in the boys jumps, taking second through fifth in the long jump and adding two placewinners to Struebing’s victory in the triple jump. Kattie Cleveland was runner-up to Wells in both girls weight events, with Maria Glidden also placing in each. 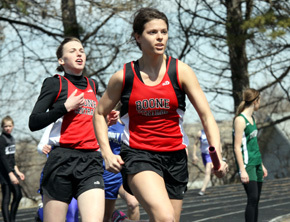 In all, Boone Central had at least three athletes place in seven events. Complete Meet Results in Print & Online Editions of Albion News.